Growlers have been used to carry beer since the 1800s, but the methods for filling them have improved drastically since then. And Shelton, Conn.-based beer-to-go concept the Growler Station is bringing the latest growler-filling technology to the U.S. It all started with customer complaints. 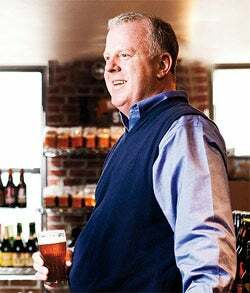 Brothers Mark and Bill da Silva, owners of brew pubs in Connecticut, found that their customers were dissatisfied with the quality of their growler system. Mark, the brew master for the pubs (and for the Growler Station), took it upon himself to find a solution. He discovered a promising Russian growler system with a unique filling process that limits the beer's oxygen exposure so it stays fresh for up to two or three months (vs. about three days with a standard filling process). He and his brother shared the find with John O'Connell and Tony Lane, co-founders of sales and marketing firm S3 Consulting. O'Connell and Lane saw an opportunity for distribution in the U.S. The system was put to the test at one of the brothers' pubs, and the results were impressive: oxygen-free, foam-free, longer-lasting craft beer. Cheers, mate: the growler station's John O'Connell saw potential in the european beer-to-go concept. "It's basically the same practice that a mass-bottling filling line for any beer company would use, and they have dialed it down to a single use," O'Connell says. Inspiration hit when the guys began researching the market and found that the systems were used in beer-to-go stores in Europe. "We thought, wait a second: Maybe there's something here from not only the distribution standpoint, but from an actual standalone-store standpoint and utilizing the systems to sell growlers," O'Connell says. The decision was obvious--if the concept works in Europe, surely it would take off in the States. The foursome jumped at the chance. They were joined by Piero Broccardo, who serves as president and CFO, and founded the Growler Station. The first Growler Station store launched in January in New York. Before the doors even opened, the company had developed a potential customer base through Facebook fans and Twitter followers. The team also enlisted a PR firm to create more buzz. While patrons cannot drink in the store, they can choose from a selection of 24 craft brews on tap and take them to go. Reusable glass growlers are sold in 32- and 64-ounce sizes, but the Growler Station also offers a 2-liter, recyclable (not reusable) plastic option dubbed "The Beast." "This is a concept that we are the only ones doing at this point," says Lane, who serves as chief marketing officer. "Now you don't have to worry about buying a glass growler, you don't have to worry about bringing it back, you don't have to worry about cleaning it before bringing it back." Prices vary greatly among the different beers. Customers can spend as little as $1.99 for a single 12-ounce bottle and up to $34.99 for a special import draft in a 64-ounce growler. (The average price for a 64-ounce growler of domestic craft beer is $13.99.) The Growler Station also sells a variety of specialty food items--from salsa and pickles to a house brand of nuts tagged GS's Nutsack--to complement its beverages. The stores are equipped with iPad kiosks that customers can use to explore the Growler Station's Beer Wizard app and discover their ideal beer. Users can search for craft beers based on food pairing, style or similarity to a brand they already know, then filter the results according to criteria such as bitterness, color and alcohol content. "We wanted to create a customer experience," Lane says. Customers who have downloaded the app on their iPhone can use it to see which beers are currently available at their local store. "The Beer Wizard app is completely tied into the stores, so when they change a beer that's on tap at the store, it will automatically update the app," he says. The venture is self-financed for now, but the founders are confident their investment will pay off. O'Connell says the store has seen consistent week-over-week sales increases of about 15 percent. Just six weeks after opening, the Growler Station was performing at a rate the founders anticipated would take five months to reach. Broccardo says the business is already at the break-even point in terms of cash flow. A second location recently opened in Greenville, S.C., and more are planned. The founders say they have received nationwide and international interest in franchising; they expect to have a full franchise plan developed this year and soon will begin actively seeking franchisees. "We've definitely built a very scalable store-level product that we can move out into the franchise community," Broccardo says. Additionally, the team has created a sized-down, store-in-store version (think: Starbucks in grocery stores), and a smaller, approximately 20-square-foot kiosk option called the Growler Station Express. The company is in final discussions with retailers that are interested in kiosks. All the company's revenue streams are tied to the modern growler-filling technology. Says O'Connell: "We're revolutionizing the way beer is delivered to the consumer."